Leaders of organizations in virtually every industry, size of organization and geographic location are reminded all too frequently that they operate in what appears to many to be an increasingly risky global landscape. Escalating concerns about the rapidly changing business environment and the potential for unwelcome surprises vividly illustrate the reality that organizations of all types face risks that can disrupt their business model over time and damage reputation almost overnight. The constantly evolving geopolitical landscape that is trending toward nationalism, ever-present concern of cyber disruptions, increasing market disruptions caused by born-digital organizations, effects of tightening labor markets, devastating impact of hurricanes and other natural disasters, volatility in energy prices, recurring shocks of terrorism around the globe, polarization of political viewpoints, the upward trajectory of interest rates, ease with which information can go viral via social media and other digital platforms, and ongoing negotiations to settle Brexit are a few of the drivers of uncertainty affecting the 2019 global business outlook. Insufficient focus on and attention to the web of complex enterprisewide risk events of varying velocity are likely to threaten an entity’s brand, reputation, business model and, in some instances, its very survival. 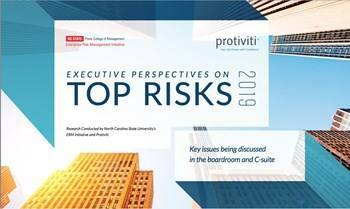 Boards of directors and executive management teams cannot afford to manage risks casually on a reactive basis, especially considering the rapid pace of disruptive innovation and technological developments in an ever-advancing digital world.